Request your free copy of the latest Briggs Equipment catalogue now! WHO ARE BRIGGS? Engineering Services SPECIALISTS! As well as supplying materials handling equipment, Briggs Equipment has one of the largest mobile fleets of service engineers in the UK. We can look after all the lifting and handling equipment on your site with a guaranteed 3-hour Vehicle Off Road response time when you need us most. We are an extension of your business, we provide the tools for you to be productive, we support your equipment to keep your operation going, we provide the data for you to manage your budget and we do all of this in whatever way suits you best. Briggs Equipment helps thousands of companies to choose the correct forklift trucks, pallet trucks, reach trucks and all the other materials handling equipment needed to make a modern business work. Becoming a Briggs customer gives you the boost you need! Bold. This one word sums up the Hyster® brand. When a materials handling application demands dependability...when nothing but the grittiest makes the grade...the answer is Hyster - among the toughest lift trucks on earth. Yale has an unrivalled heritage in the design and manufacture of a wide range of materials handling equipment, from speciality warehouse equipment to traditional counterbalanced forklift truck models, powered by electric, diesel, LPG, CNG or even hydrogen fuel cells. 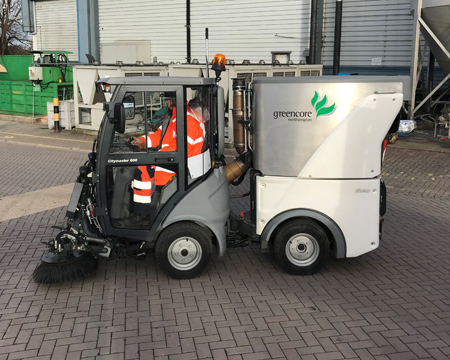 Leading international food manufacturer Greencore has drawn on the diverse MHE offerings of Briggs Equipment to help drive cost efficiencies and to provide a unique customer service at its Food to Go facility in Northampton. Customer service is key to Universal Flexible Packaging FLT needs and Briggs excel with this. They are thorough, attentive and meticulous in their approach. The online trackers are also painless and very easy to use especially when accessing FLT operating details. Dealing with Briggs has been a pleasure. We look forward to developing a great working relationship in the future. We are very happy with the recommendations made by Briggs UK for our fleet requirements to date. They have provided the CA Group with an excellent fleet of forklift trucks capable of working in our busy environment and handling the bespoke materials we process on site. We have also had positive feedback regarding the new fleet from our operators. Briggs has delivered the ideal solution. As well as providing the support we need, the fuel efficient truck is proving popular with operators thanks to its manoeuvrability, ease of operation and comfortable cab. We were very impressed by Briggs Equipment’s understanding of the changing face of logistics, its ability to offer real flexibility in materials handling solutions and its willingness to work closely with us to determine the most appropriate equipment mix. When you need high performance equipment, industry-leading service support and clear reporting about cost savings in your materials handling fleet, Think Briggs! Contact us today and see how we can transform the way your business moves.